Written by Arne Havsø; owner of three Stabyhoun, hunter and experienced gun dog handler. Huntning dogs are born with a set of special skills: Search, Point, Chase and Kill. In my experience, dogs cannot learn these skills. They can only develop them. Until now I am yet to meet a Stabij that does not have these skills, in some measure, already. So how do we go about harnessing their abilities and shaping them into a sound working companion? As a breeder who wants to promote the Stabij as a working dog, being aware of these skills and taking notice of them is crucial. Looking closely at the puppies in a litter tells me which experiences to provide for each puppy, and which one has the strongest working abilities. This helps us decide which home they should go to. From when the puppies are only a few weeks old, we introduce them to different animals in the whelping box: duck, pheasant, moose, deer, rabbit and more. From the age of about 5 weeks, we start training gunshot from a distance – starting from around 30 meter away and then firing the gun nearer and nearer the pups. At this same age we begin hiding living birds in a safe cage, set the puppies free and let them use their natural abilities to search and find them. It is wonderful to watch the puppies’ reaction when they get the smell of the bird in their nose. All this is done as play and fun. For me as a hunter, it is important that no animal is ever left injured or dead in the field. This is one of the key reasons why we train our dogs to search and retrieve – both on the field and in water. Training a Stabij to be a gun dog is great fun. To see the happiness in the dogs’ eyes when they are working is my reward for all the time I’ve spent training them. This breed, with its outstanding nose, is excellent for searching both track and field. I train my dogs to use their nose on the ground (track) and in the air (field). Although we want the training to be fun, obedience is important. We are talking about shooting moving birds and therefore, my dog must stay calm when the bird are being flushed and I’m shooting. He shouldn’t move until I give the order to retrieve the bird. Retrieving in water | Sit calm as I throw a dummy and shoot | Go into the water | Swim | Search for the bird | Retrieve the bird | Come back | Deliver the bird. Before I go any further, the dog must master every single exercise accurately and as directed. Then we can start to combine the element; first two, then three and so on. This is my approach to training retrieving, obedience, search and track. When we start to train a young puppy to search out game, I will use a frozen animal or blood which I then drag on the ground for about 30 meters at first. The Stabyhoun uses its natural instincts as soon as they catch the scent. It is great fun to watch them work, and the key is to provide a reward at the end; perhaps a bird or leg of a deer. I train search in the fields outside of the shooting season – starting by hiding dummies in an area 50 X 50 meter large. As the dog begins to understand what to do, I increase the number of dummies. Then we introduce dead birds and other small animals, and finally we use live birds in a cage. Because I know where the bird is, and because it doesn’t fly off, I can clearly see the Stabyhoun point when it finds it. In the beginning, some Stabyhoun only pause for a second or two before their inclination to chase kicks in. Like many of the pointing breeds, they sometimes prefer to chase rather than point! 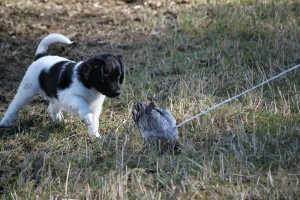 Quails are a great bird for developing the pointing abilities in the Stabyhoun. This bird has a strong smell and is a poor flyer. But always keep the dog on a long leash to stop them from attempting to catch the bird. This is never their job. I do find it helpful when the dog understands which bird we are hunting for; that they know the scent. It takes a bit of time before they learn them all, but then they engage at great speed and enthusiasm. Until now I haven’t meet a Stabij that doesn’t point and which hasn’t been able to develop that skill further in just 3 rounds with a bird. So how does the Stabyhoun compare to other breeds? I have been training alongside many different breeds of gun dogs (FCI group 7). Pointers, Setters, Small Munsterlanders and more. The biggest challenge for me with the Stabyhoun compared with those is in making my dog search and point further away from me. When I hunt, it is perfectly fine that the dog is searching within a radius of 50-100 meters from me. But in competitions, some judges consider this too close. In every skill I firmly believe that the Stabij is as good as all the other breeds in Group 7. But when it comes to using their noses and tracking an animal over distance, they truly excel. 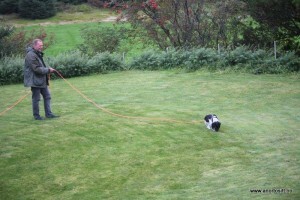 So give it a go – whether your Stabij is a puppy or an adult. I am confident you will enjoy watching him catch a scent and find the prize; whether that is a bird or something else.